Glass is a great and appealing material that gives rooms and furniture an aesthetically pleasing look and feel in the first place. The same applies to mirrors that have a function on top of that and can be used to realise certain effects. But glass and mirror surfaces have also a shortcoming: They need a lot of care and require special cleaners to maintain their appealing look. With Caramba’s glass cleaner, you ensure by yourself a clear view, shine and streak-free mirrors. Use this cleaner to make glass and mirror surfaces to shine anew and thus ensure cleanliness and indoor environment quality. Caramba glass cleaner comes in a ready to use package and is especially versatile. There is no glass or mirror surface the cleaning of which is not easier with this product. Its special formula ensures that dirt is effectively dissolved and removes insect remains and soiling due to dust, weather and finger marks just as deposits by nicotine or kitchen vapours. But yet, this glass cleaner is very gentle to the material and ensures streak-free shine and crystal clear view. You can use this cleaner also as a glass and ceramic cleaner for stainless steel as well as for plastic surfaces such as Plexiglas or polycarbonate. Therefore, our glass cleaner is versatile and will make your home cleaning easier just as our other products for home and garden. 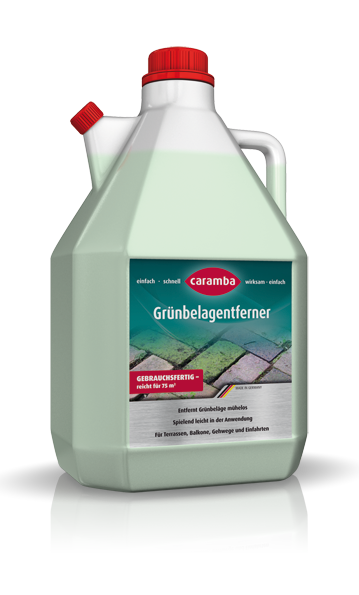 Our glass cleaner from Caramba comes in a convenient spray bottle with a capacity of 500 ml. Use it undiluted as a glass cleaner foam and spray it onto glass and mirror surfaces. Already after a short soaking time, you can wipe off dissolved dirt using an absorbent cloth and repolish using a dry cloth. In this way, all your mirrored wardrobes, glass doors or windows will soon shine anew. Mirror and glass cleaning made easy: With our Caramba glass cleaner, a mirror finish lies in your own hands.